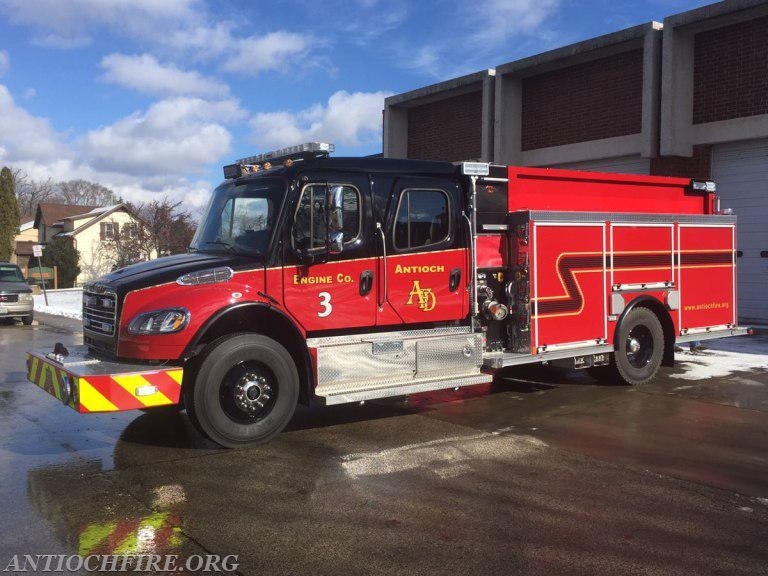 The Antioch Fire Department is pleased to announce the newest addition to our fleet; a 2016 Rosenbauer MP3 Engine on a Freightliner M102 chassis; 750 gallon water tank, 30 gallon foam tank, basic extrication equipment and firefighting tools. This vehicle was made possible through a State of Illinois Firetruck Loan program which the Department submitted an application in Fall of 2014 and thanks to the work of the Apparatus Committee; this vehicle has the some of the latest technology while holding the line on costs. Additional cost savings were realized through programming of radios in-house, mounting of all the equipment in-house and moving much of the loose equipment from one of our existing rigs. Crews received the first round of training this week and will be spending the next two weeks or so conducting driver training, pump training and overall vehicle familiarization prior to placing the NEW ENGINE 3 in service! A special thanks to Tim Olk for snapping this photo!